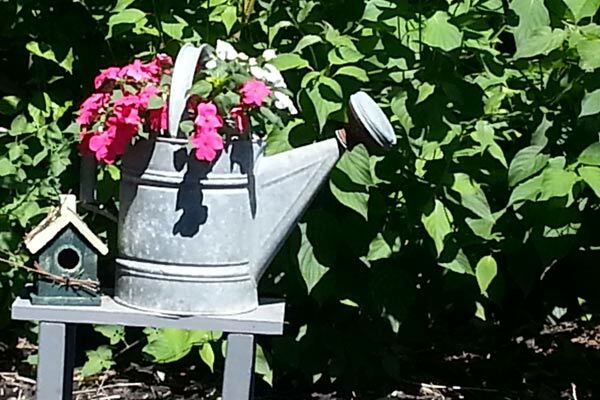 Once a watering can is old or leaky, it’s time to use it as garden art. 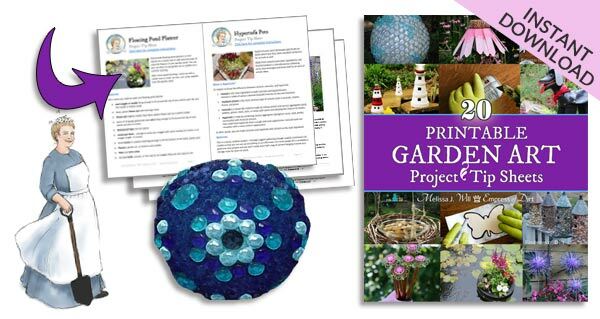 I’ve gathered these ideas from my own garden and gardens I have visited. 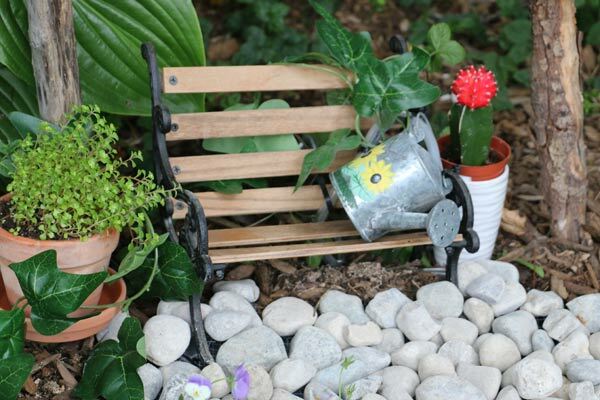 Have a look and grab ideas for your outdoor space. 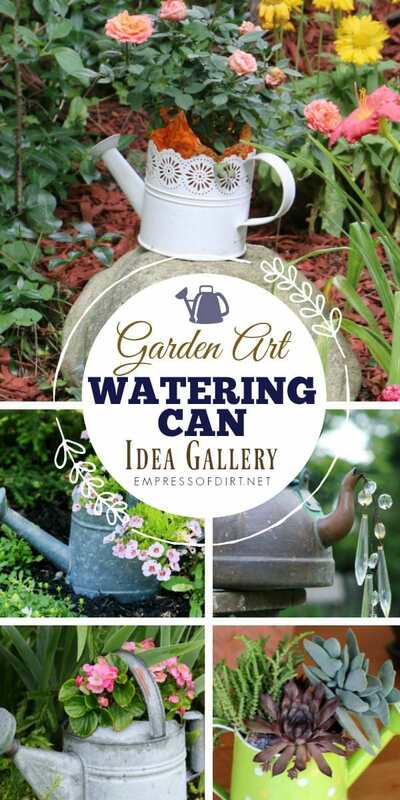 You can also find instructions for making a Garden Art Watering Can with Faux Spilling Water here. 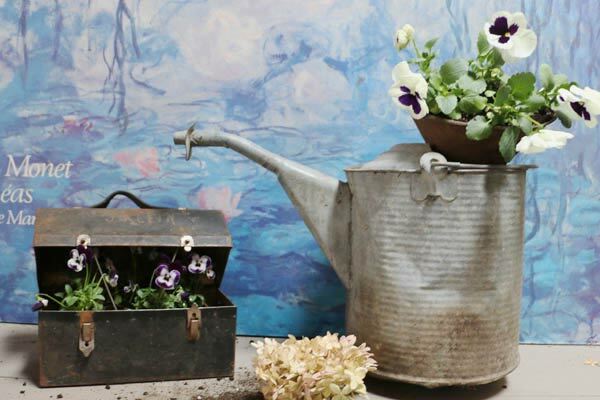 My favourite watering cans are the older ones made from galvanized metal as well as newer ones painted in clear, bright colours. 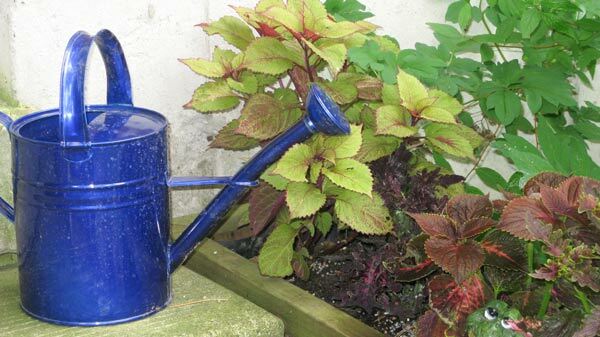 If a watering can is really well designed, I’ll actually use it to water plants (crazy, I know), but any other odd ones are perfect for garden art projects. 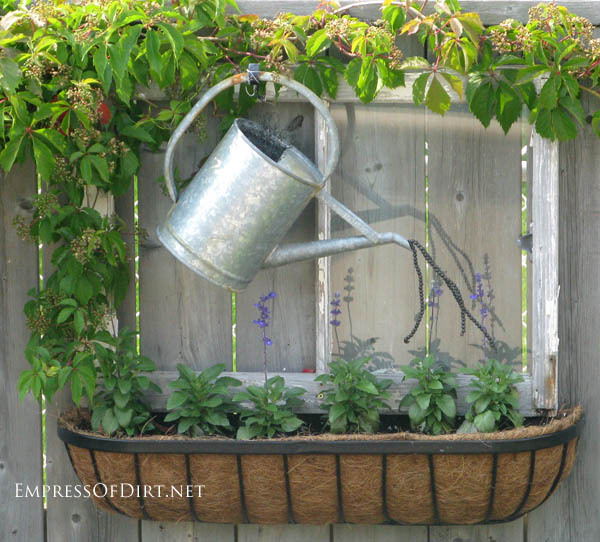 And don’t worry if they have holes in the bottom—those ones make great planters. Always good to have an heir and a spare! 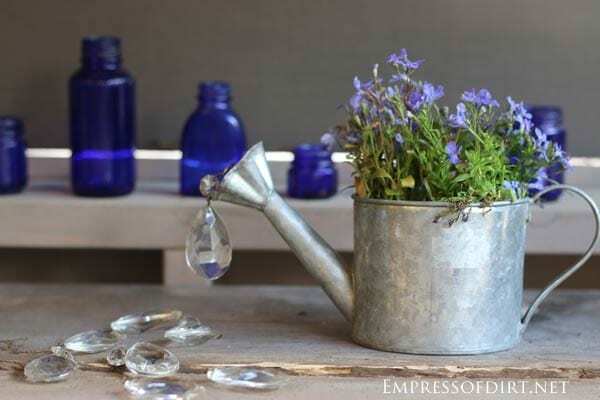 Use lamp crystals (prisms, pendants) as well as marbles, copper wire, and beads to create faux water. 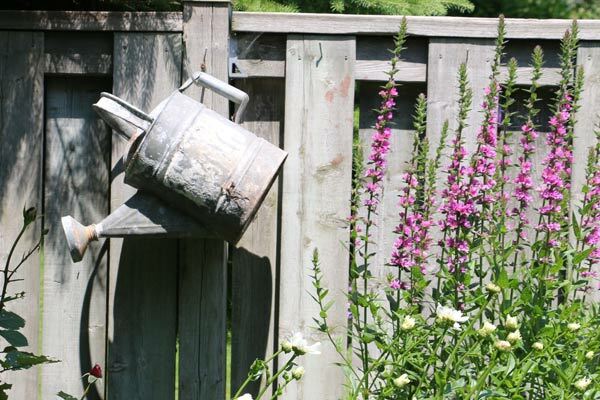 Is it possible to collect watering cans without ever paying more than $5 per can? So far, so good. 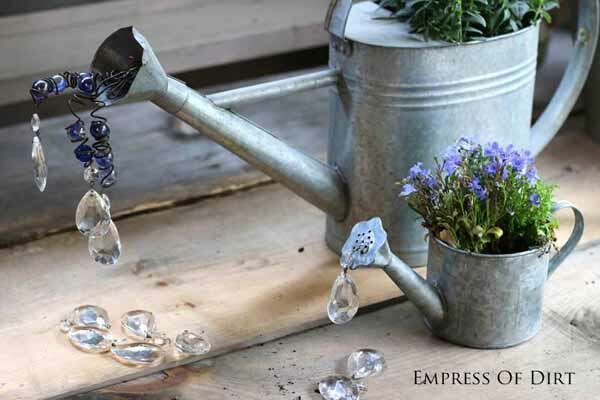 One single lamp prism makes a lovely, giant water drop. 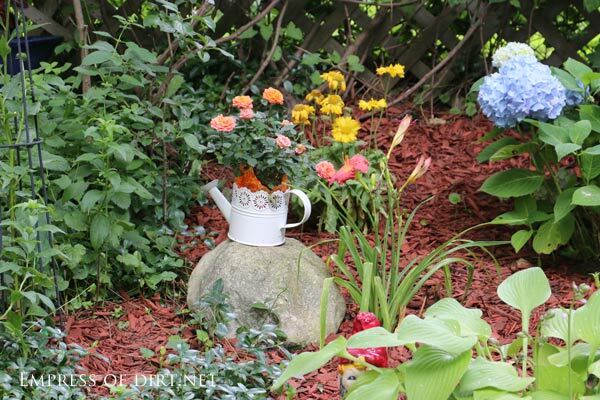 Old kettles and water pitchers work just fine too. 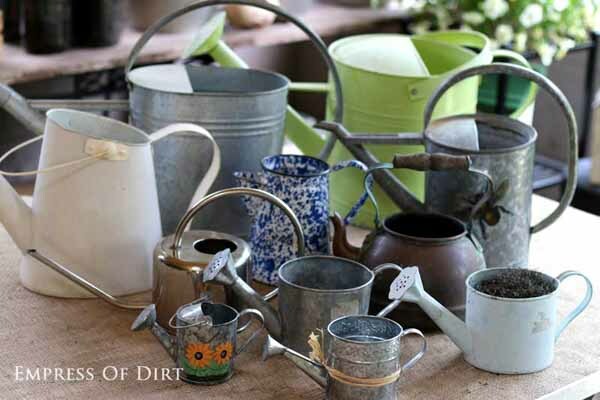 If you love rust, have a look at my Rusty Garden Art Gallery. Here I wrapped copper wire around marbles and attached the lamp crystals to the wire ends. 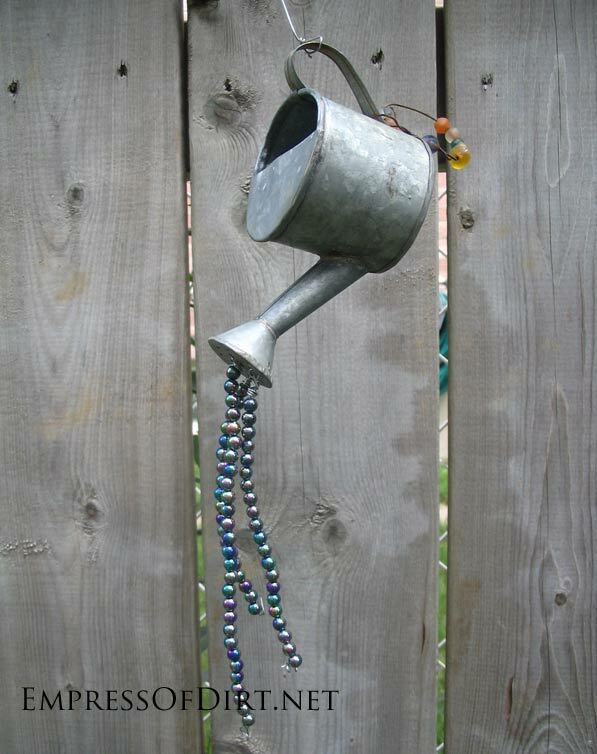 This was the first watering can art I made (circa 2002, I think). 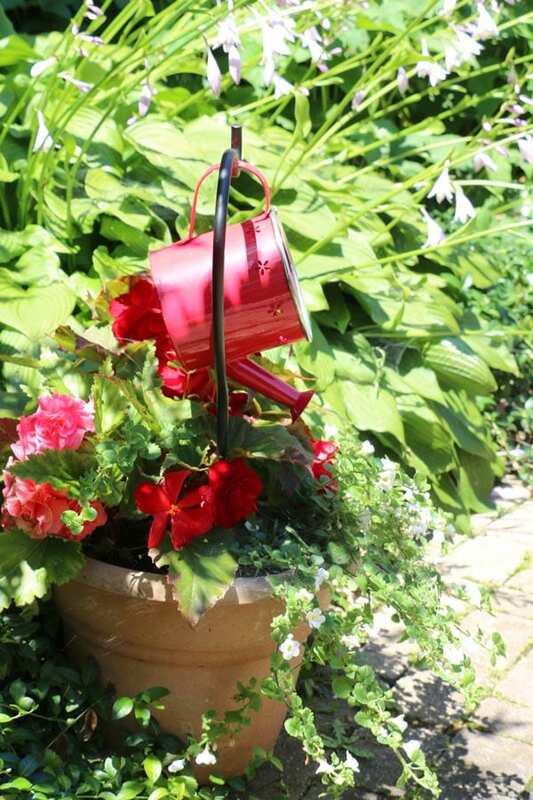 If you vary the length of the wires, it gives a good spilling effect. 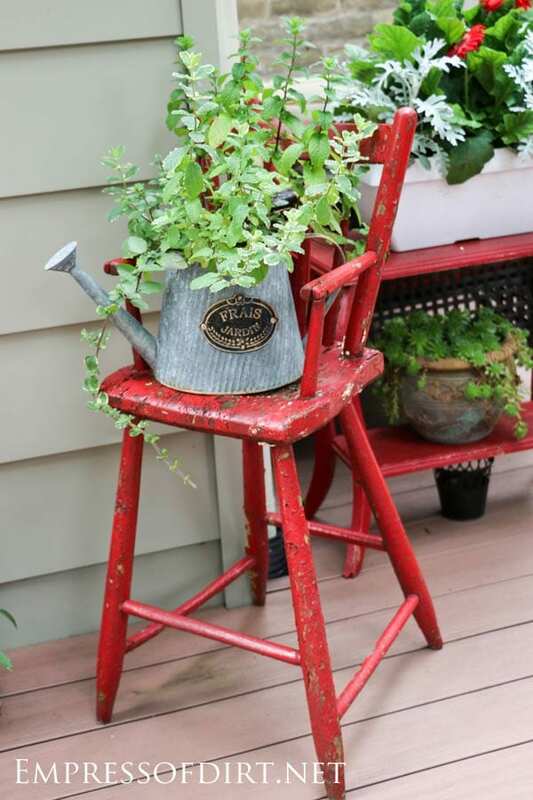 I love the red chair with the simple watering can and greenery. Perfection! 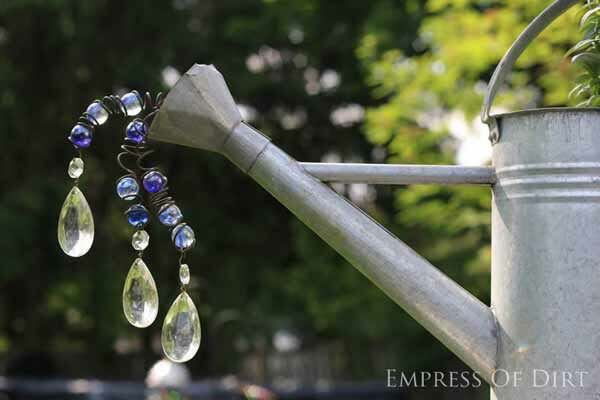 This next one is a watering can fountain I rigged up for a fairy garden. 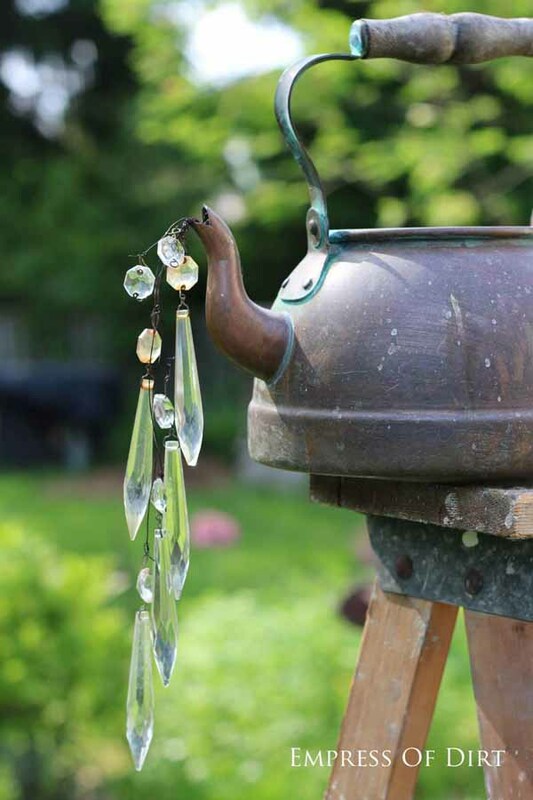 The water pours out onto the stones which hide a little reservoir and pump. 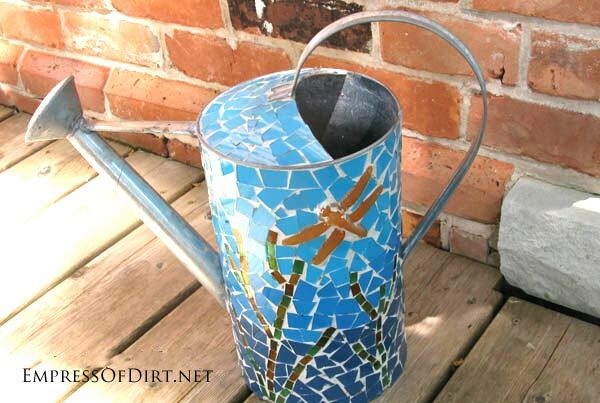 If you like a more detailed project, add mosaic tiles to your favourite watering can. Because art makes everything better. 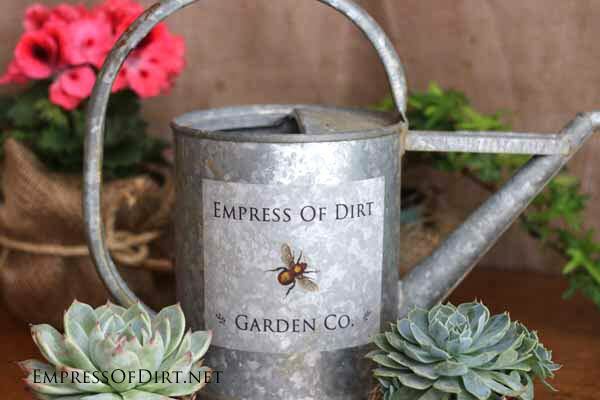 I made a custom watering can by adding a made-up Empress of Dirt brand label. 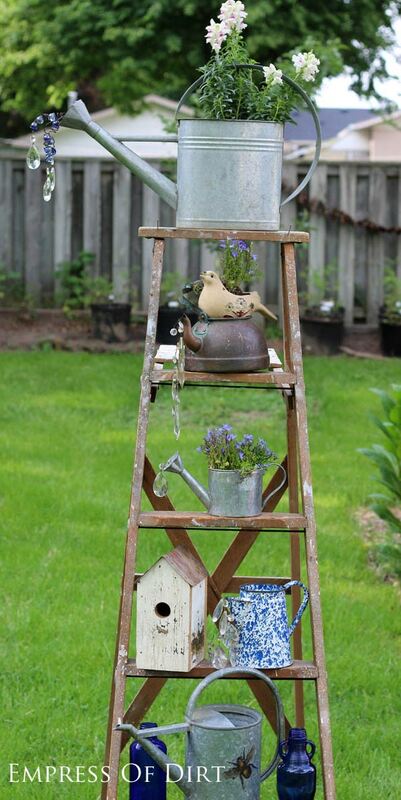 Old wooden ladders have lots of uses in the garden from trellis to displaying favourite garden art. 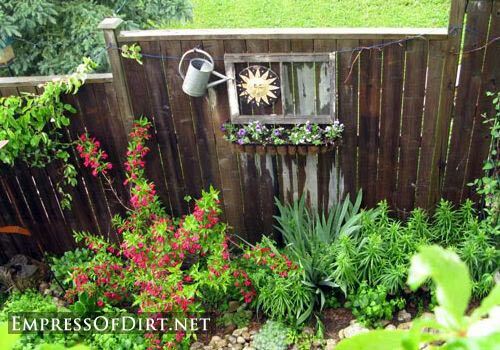 And the more paint splatters, the better! 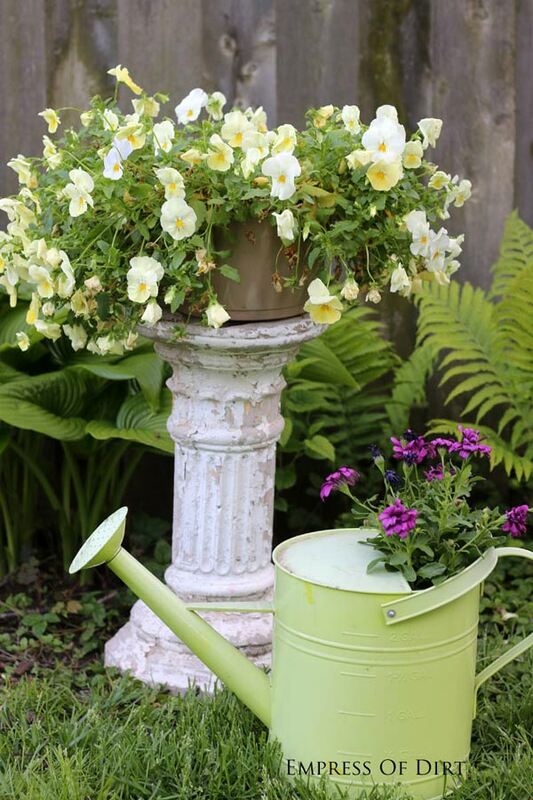 Add a pot of flowers to a watering can and add it to the garden. Easy! 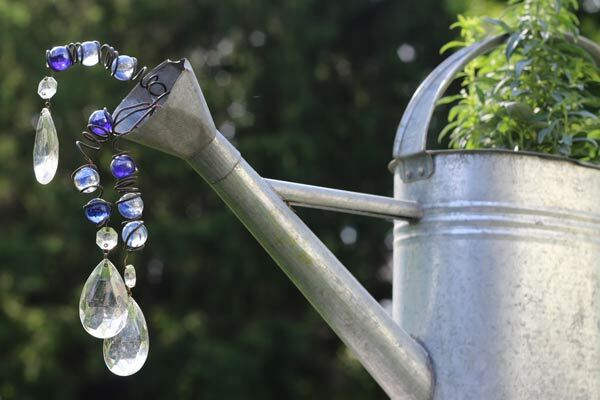 The way some watering cans are designed, it can be difficult to thread wire in the spouts for hanging faux water droplets. 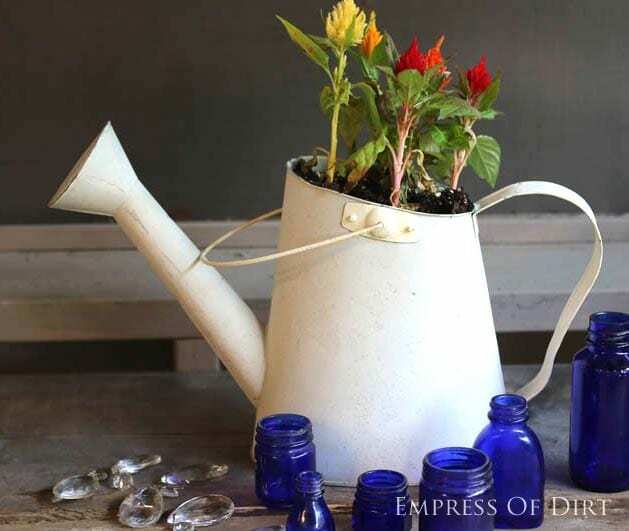 This white one could be painted, mosaic-ed, decoupaged, or simply used as a planter like you see here. 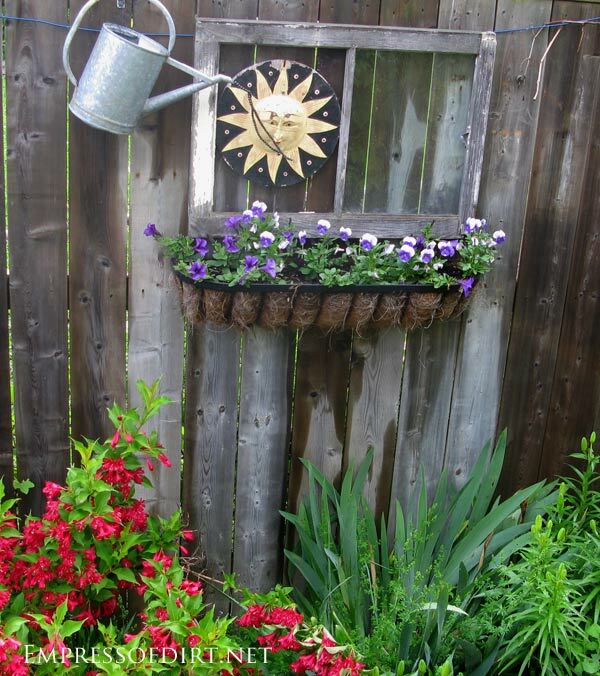 This was at my old garden where I hung watering cans over window boxes along the fence. 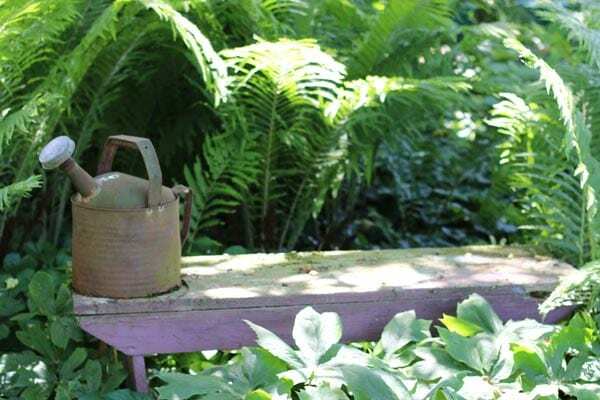 The great thing about garden art is you can change it up whenever you want and move things around. 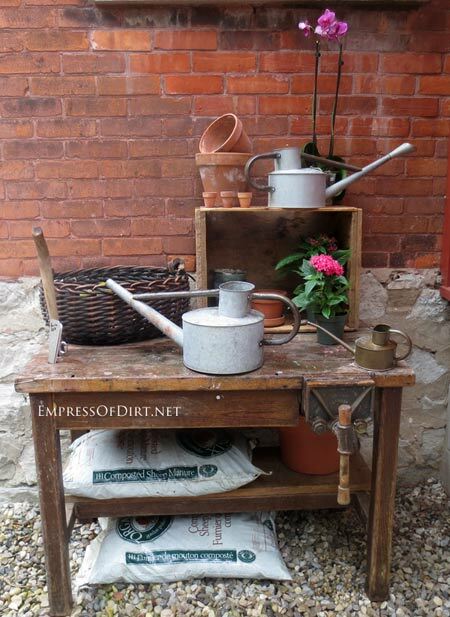 Potting tables are one of my favourite garden art display areas. 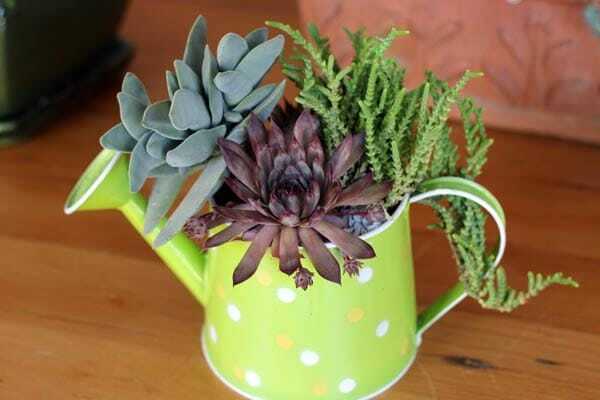 You can see an entire gallery of potting table ideas here. 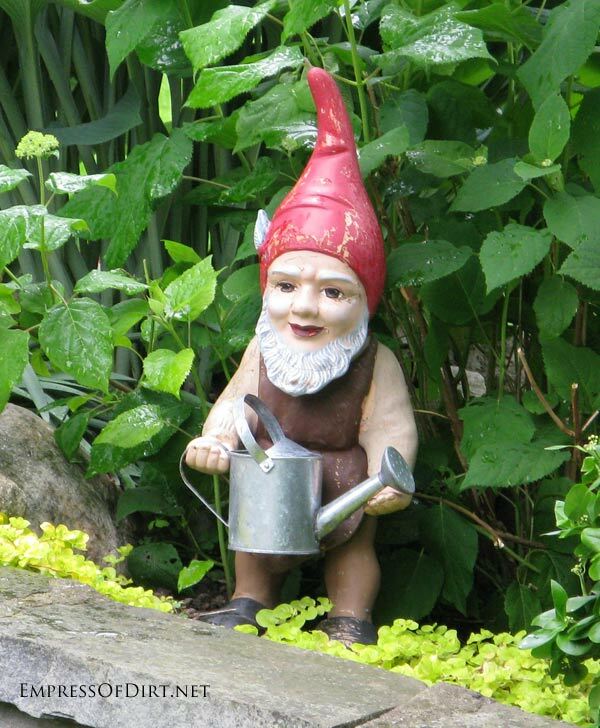 Don’t let those gnomes lounge around all day! Put them to work. Sounds like you’re enjoying the book as much as I do! Thanks for your note and I’m glad you’re enjoying it. 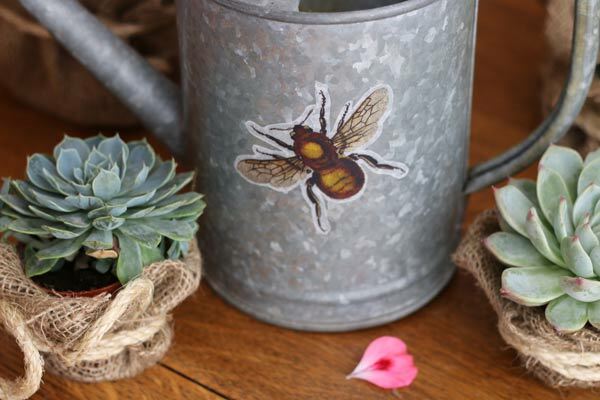 Share a link if these are on your blog – would love to see them. 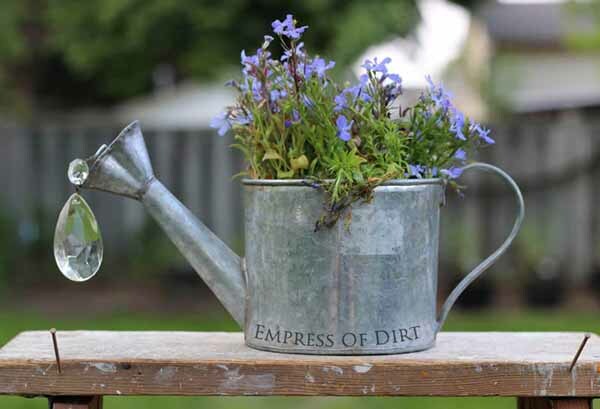 Never saw an old watering can I didn’t like, and these are some wonderful ideas on how to make them even more interesting! Thanks, Barb. Glad to have such a fine fellow fan of the cans!